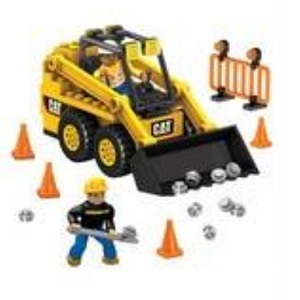 Product Detail Summary: Build the specialized Skid-Steer Loader by Mega Bloks CAT and perform all kinds of specialized fine digging duties needed around your little foreman’s construction site. The Skid-Steer Loader comes with a front bucket that really lifts, construction tools, hazard barrier and little pieces for the Loader to carry. Ideal for children ages 5 and up!